The advent of the friars, and especially the Dominicans and Franciscans, brought a whole new world of learning to Ireland. 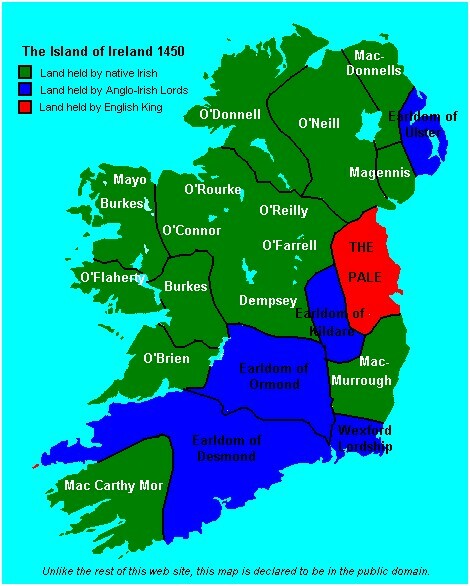 Through the colony the medieval papacy was brought into closer contact with the Irish than ever before. Because the early upper-class settlers spoke French and were products of French-orientated civilization, they brought with them a code of chivalry and vision of courtly love which was to leave its mark on Gaelic Literature of the period. The feudalized part of Ireland, then, the areas settled by the colonists, was part of a wider community – the feudal world of Western Europe – and was benefiting from that contact. It was a land of manors and villages with broad fields tilled in strips, a land of castles and small cottages, markets and fairs, parish churches, abbeys and friaries. Forests were cleared, more land was ploughed as new methods of agriculture was introduced. Commercial life expanded and trade boomed. New walled towns, like Athenry and Nenagh, sprang up everywhere. Old ports were developed, such as Dublin and Waterford, or new ones created like Drogheda, Galway and New Ross. By the late 13th century, the newcomers had absorbed much of O’Brien’s kingdom of Thomond, and had McCarthy control in South West Cork was reduced, and the lands parceled out to followers of Robert Fitz Stephen and Miles de Cogan. The Norman land owners strove hard to ensure that the Gaelic Irish people would remain to herd cattle and till the soil, as they had been doing under their native chieftains. Now for the first time the Neolithic (systematic) type agriculture and estate management was put into practice. Monastic orders, such the Carmelites, Agustinians, Fransciscans, built the local parish church nearby and large farm units were divided amongst supporters who were linked to the overlord through allegiance and through rent. The monastic establishments strengthened their position in the various districts that they held sway and Pope’s authority once more was at the centre of a true Irish Catholic Church – according to the Norman conquerors or a more likely reason the Norman Landlord had an institution to support him. Many of the castles in the south Co. Cork have Fitzgerald origins and commanded the principal routeways and waterways in the region. Over 400 castles were built in Co. Cork alone during that era. By 1420, the Fitzgeralds became the Earls of Desmond. Maurice Fitzgerald is said to have been the founder of Youghal and his general strategy was to protect and consolidate the power of the Geraldines by the development of trade. The statute passed in 1464 by Thomas Fitzgerald, showed that they fully understood the importance of commerce. “As the profit of every city and town in the land depends principally on the resort of the Irish people bringing merchandise thereunto, the people of Cork, Waterford, Limerick and Youghal may trade with the Irish in spite of statutes contrary”. The Norman land owners were found mostly in the Midlands, the eastern Leinster counties and the valleys of eastern Munster. By 1485 one can see from the map below that the Norman settlers owned a large portion of Munster, and Leinster and a lesser portion Connaught an insignificant portion of Ulster.